"Chicken Cordon Blue with a yummy sauce." Flatten chicken breasts without breaking through meat. Roll each ham slice in a cheese slice, then roll up in chicken breasts. In a shallow dish or bowl season flour with salt, pepper and paprika. In a separate dish or bowl beat together eggs and milk. Dip chicken rolls in seasoned flour, then egg mixture, then bread crumbs. Heat oil in a large skillet and fry chicken in hot oil until golden brown. Set aside. To Make Sauce: In a large bowl combine the soup, mushrooms, garlic powder, curry powder, wine and sour cream. Mix all together. Place browned chicken in a 9x13 inch baking dish. Pour sauce mixture over chicken and bake in the preheated oven for 15 to 20 minutes. Garnish with fresh parsley sprigs. This delicious recipe only seems difficult. See how it’s done! great taste but it would have been great even without the sauce...next time! 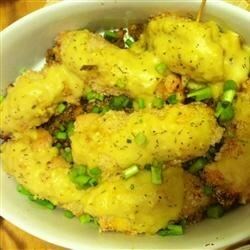 This recipe was OK but I found the Chicken Cordon Bleu II found on this site to be much much better. This has been one of my favorite dishes! One of the best and my family & friends rave about it! Some people dont care for the curry. Tastes great without It's your preference.